Made from stretch denim fabric, with a Clarino full seat. 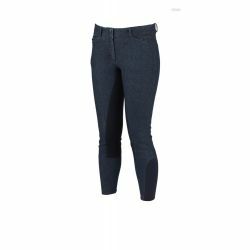 The New Dublin Supa Shape It Denim Full Seat Breeches are part of the Dublin range of jods and breeches that offer a choice of fits and fabrics, all with the emphasis on comfort and fit. Made from stretch denim fabric, with a Clarino full seat. With a stretch side panel on the lower leg, for improved fit and comfort as it helps to reduce bulk and rubbing under long boots or gaiters. Beautifully tailored fit that flatters a more curvy shape, with a navel high waistband.